For this job you’ll need bunch of lots of socket wrenches, extensions, vice grips, star wrench, hammer, etc. To be more specific, to do this job you will need many tools. You may be able to do the job in the parking lot of your apartments, but it may take more than one evening to finish the project. At the bottom of the article, you’ll also see my DIY video, where I explain in detail how to do each step of the project. First step is you’ll need to figure out why you need to replace the assembly. 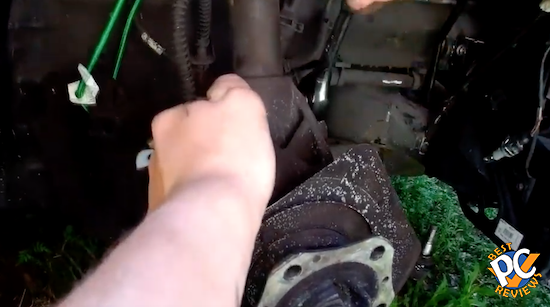 If you need to replace the wheel bearing, you just need to remove the assembly, replace the wheel bearing, and then put the assembly back. If you need to replace the assembly, my advise is make sure your replacement assembly has new wheel bearing, so that you won’t need to remove everything again a year later just to replace the wheel bearing. 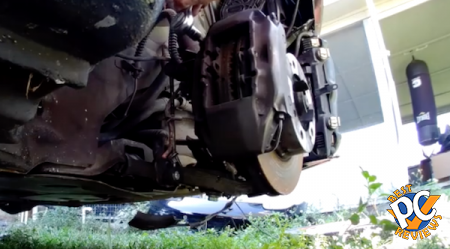 In my case, my boxster was involved in an accident, so I replaced the assembly because the vehicle was hit from the side. Maybe I did not need to replace it, but I decided that it will be better if replacement gets done. So in my case, I did not need to remove the axle nut as I was not taking the knuckle hub assembly apart. If you will replace the wheel bearing, you will need to take the axle nut off. 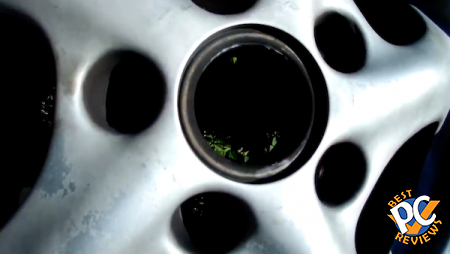 To do that, you can remove wheel cover to get access to the axle nut and then loosen it. 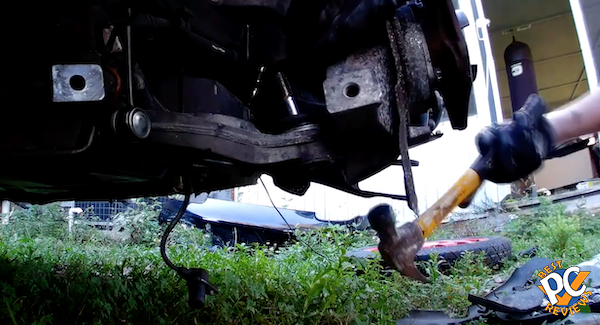 If you have impact wrench with air compressor, you may be able to get the axle off while the vehicle is lifted. The first step is to remove the brake caliper. 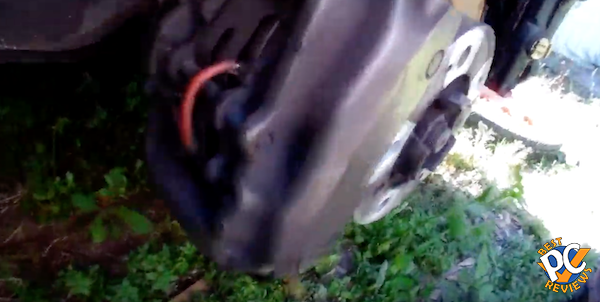 We’ll start with taking off the brake pad sensors. 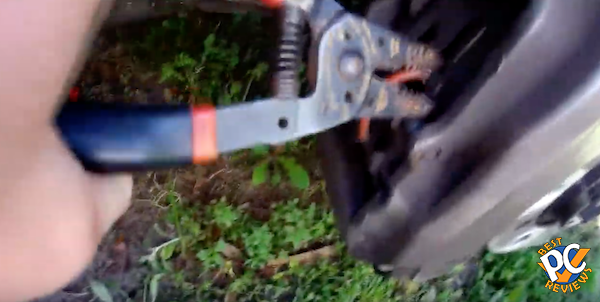 The best tool for the job is nose pliers, but I did not have any. I used wire strippers and it did it’s job. Just be careful and don’t damage the wires. Once sensors are off, remove the small pin retainer. I used a small flathead screwdriver for this task. Word of caution, be careful and don’t lose the pin as it is pretty small. 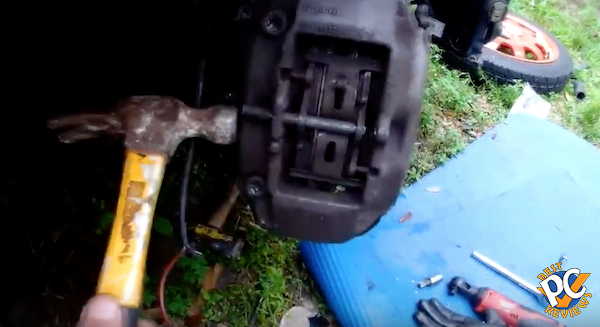 Next we’ll push the metal retaining pin out of the brake caliper. At first I used a small flat head screwdriver with a hammer. Eventually, when I was out of room, I used a big long bolt and hit it with a hammer. It took some time, but it’s doable. Once that it’s done, there are two star bolts (T55) that attach the brake caliper to the wheel hub. We’ll remove the bolts now. 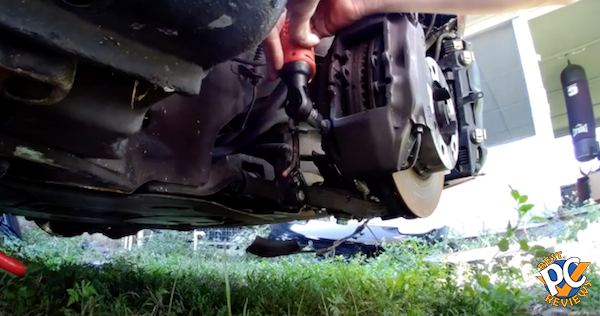 At first I used socket wrench, but once I got to loosen the bolts, I used a more comfortable battery powered tool. When bolts are removed, there is nothing else holding the caliper. I used a flat head screwdriver from top and bottom to pry out the caliper. 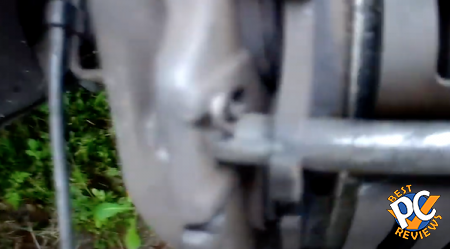 Once thing I forgot in the video, there is one bolt (10mm) that holds brake line to the wheel hub. 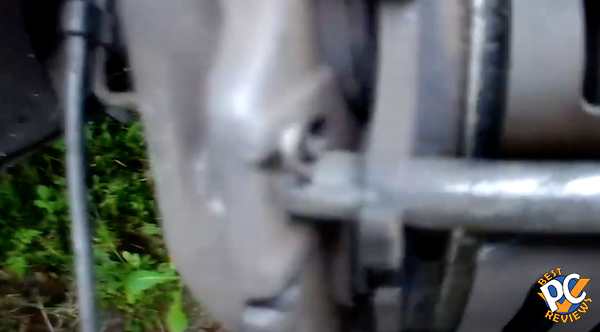 I removed it after I pried out caliper, but it would be a good idea to take that bolt out before. 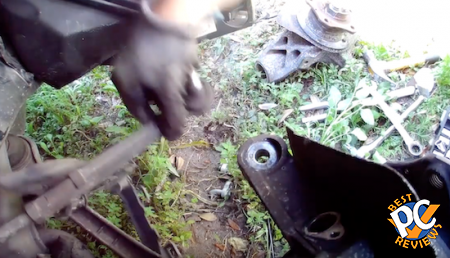 When I removed the bolt, I actually stripped it. If it happens, it’s not a big deal, but always good to try to save everything, so it will be good idea to spray some WD-40 or punkbuster on the bolt before you attempt to remove it. 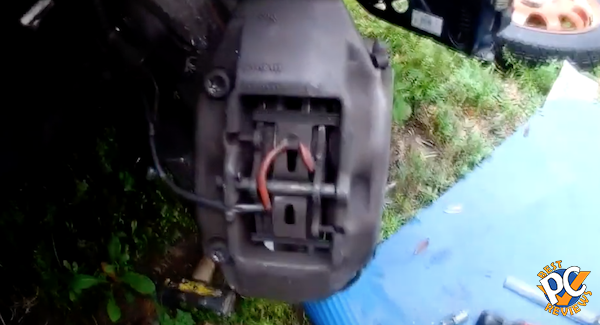 When caliper is out, hang it on springs with a cord to make sure brake line stays in good condition. Now we’ll remove what appears to be a bracket with connector for ABS. 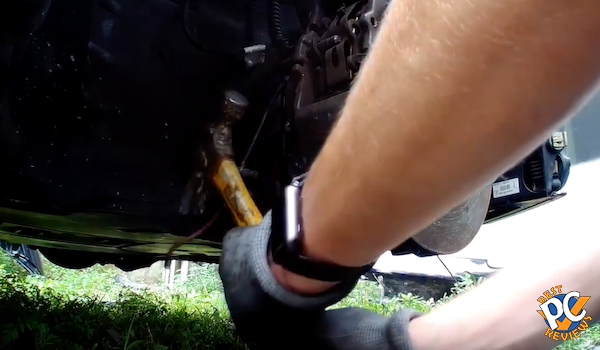 The bolt is also 10mm and it came off pretty easy. 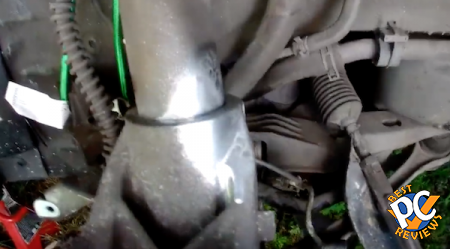 You’ll also need to remove the ABS sensor, which is secured by T30 bolt. It came off really easy on my old wheel hub, but for unknown reason it was extremely tough to remove it on my replacement wheel hub. 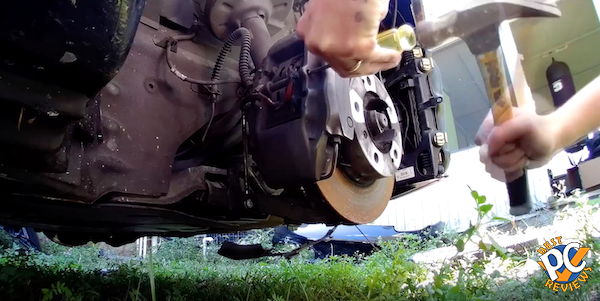 It’s time to remove the rotor as there should be nothing in the way. Mine was secured by 2 Philips screws. You might have anywhere from zero to three. Mine came off pretty easy and I used a regular Philips screwdriver. If yours won’t come off easily, be very careful and make sure you don’t strip them. Try to use some impact tool and in worst case scenario, you may need to drill them out. 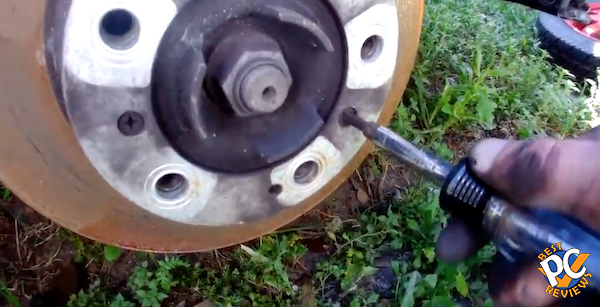 Once all screws are out, simply pull out the rotor. 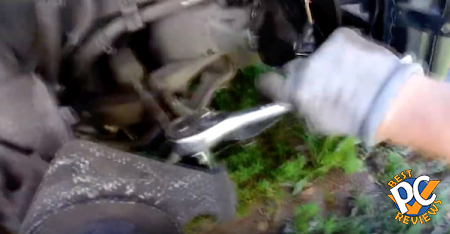 Let’s remove the tie rod end. I started by unscrewing the 18mm nut on the top. You won’t be able to remove the nut completely that way as the ball joint will eventually rotate with the nut. That’s why you absolutely need to have T40 star and 18mm wrench. If you have the rotating wrench, it will be much easier. 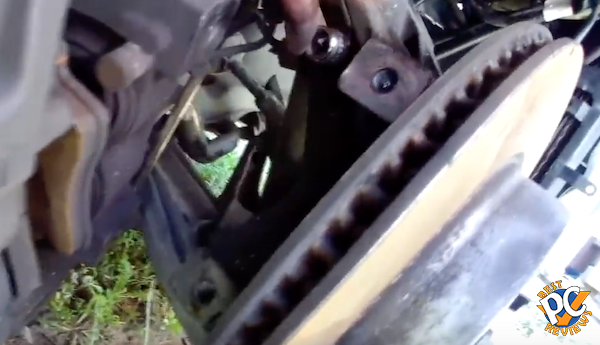 When you get the nut almost off, you’ll have two options to take the tie rod end off. First one is using a hammer. 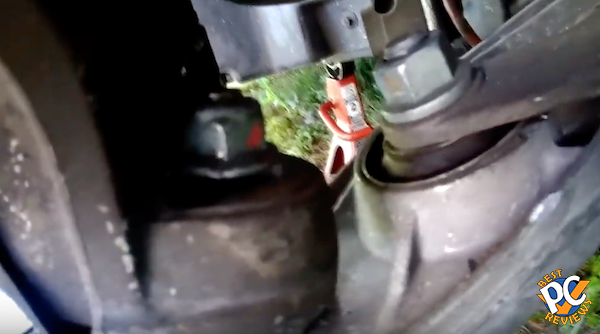 You’ll have to beat on the nut with a hammer until the tie rod end going to pop off or slide down. Second option is to use ball join separator, which is a separate tool. I personally have more luck with hammer. I heard people say that hammer may damage something, but I never had any issue with hammer. I used a bigger 4 pound hammer to do the job. 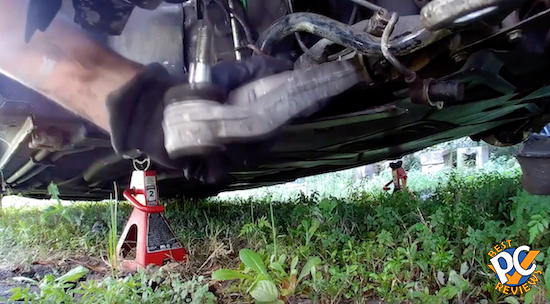 After several hits, I was able to get the tie rod end to drop. Once it drops, simply unscrew the nut completely and then remove the tie rod end. As I mentioned before, inspect your tie rod ends. If they’re bad, be sure to replace them now. Now let’s get to the sway bar links. 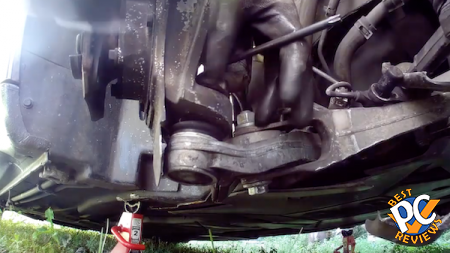 As with tie rod ends, make sure you inspect them as well. For the top portion of the sway bar links, you’ll need 18mm wrench and 18mm socket wrench. On the sway bar links side, you’ll put 18mm wrench and on the side that has the nut, use the wrench socket. 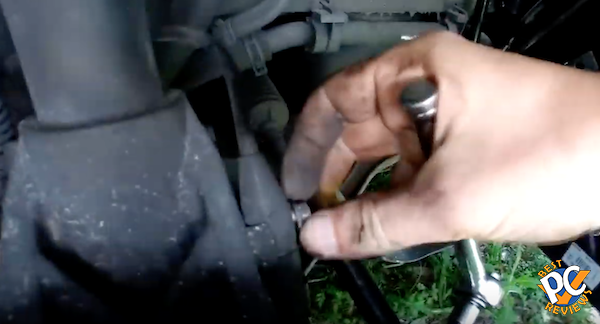 While you’re holding down the wrench, completely unscrew the nut with socket wrench. To remove the sway bar link from the wheel hub, start by lightly beating the thread with hammer from one side. Then wiggle the ball joint out by turning wheel hub back and forth. If that does not work, use a pry bar to help you remove it. Inspect sway bar links. If they’re in bad shape, replace them. I will do a full guide later on replacement of them, but its pretty easy. Just remove another end and replace. I painted top portion of wheel hub and strut just to remember where exactly the wheel hub was. I did it just in case I’ll have confusing on how high or how low to put the replacement. 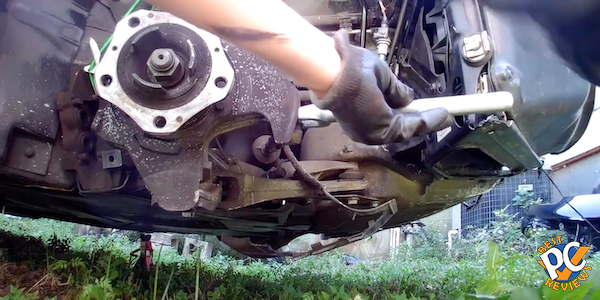 Now we’ll remove the lower control arm from the wheel hub. 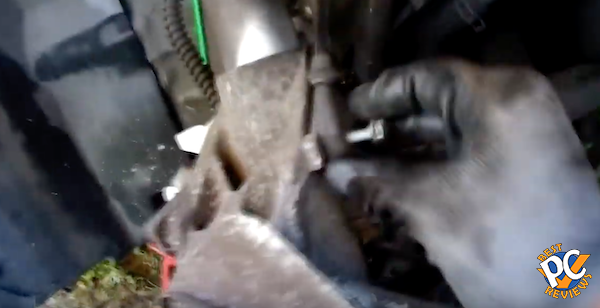 Just like we did in removing tie rod end, to remove the lower control arm ball joint, we’ll use 18mm wrench and T40 star tool. 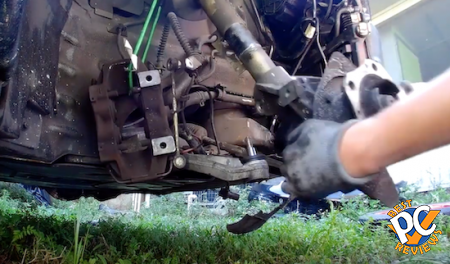 I used ball joint separator again and this time it worked. Remember that now you can turn wheel hub around freely as you removed the tie rod end. Use it to your advantage. 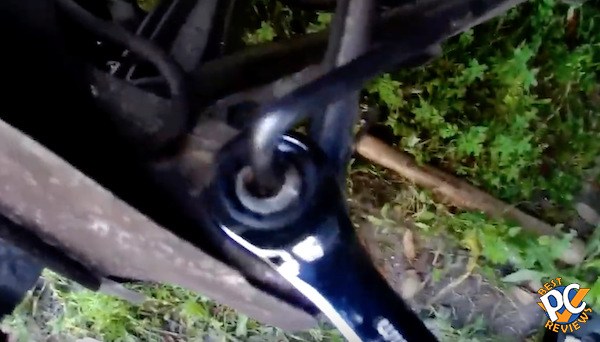 To have more room, I also removed bolt and nut on the fork that is attached to the control arm. 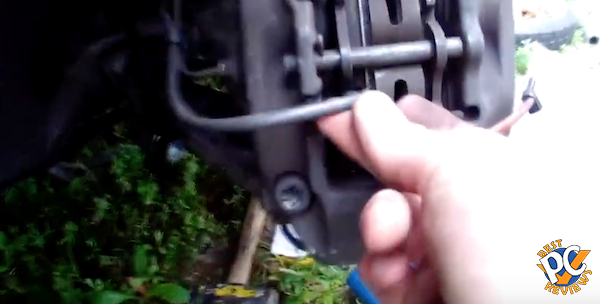 I used vice grips to hold the nut and used 18mm socket wrench to remove the bolt. Now lower the control arm and slide wheel hub away. 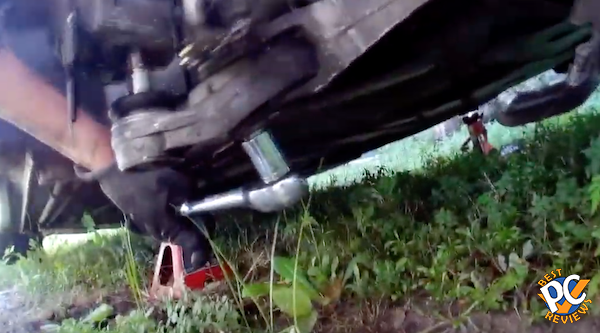 Once wheel hub is a bit away, lower it all the way to the ground. Congratulations, it’s off. Now, if you have wheel bearing problem, replace it. If you just want to replace the whole wheel hub, put the replacement back in. As I said before, if you are replacing the wheel hub assembly with another used one, my advice is to change wheel bearing before you put everything back in. It may save you lots of time in future. Installation is pretty much in reverse order, but I’ll still provide you with needed details. Slide wheel hub back. It looks easier than it really is. It took me some time. First slide it in with your hands. 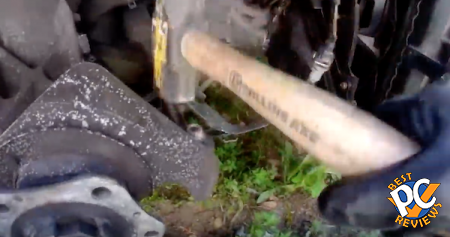 Then gently use hammer to guide the wheel hub back in its place. 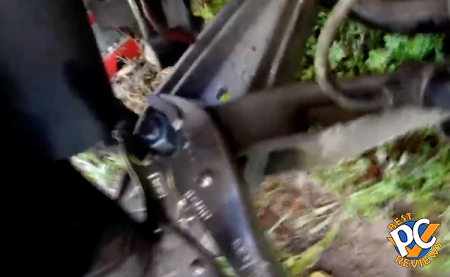 Now move the fork back on the control arm, but do not secure it. 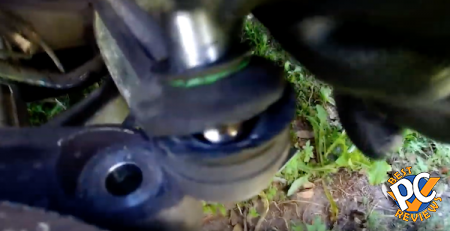 This is very important, make sure you move fork there BEFORE you attach ball joint on wheel hub. 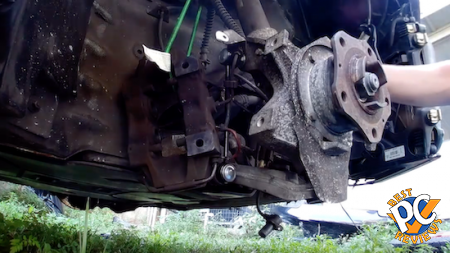 You may need to move wheel hub a bit higher than its standard position just to have enough room for lower control arm to attach to the hub. 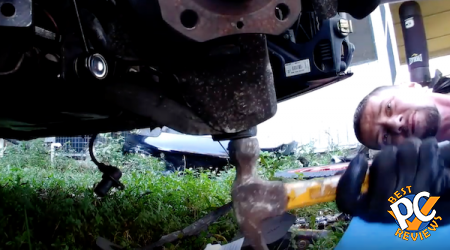 I also used hammer to get control arm ball joint into wheel hub. And as I said before, you can turn around wheel hub to your advantage. If you moved your wheel hub higher than standard position in order to attach control arm, now you can use hammer from top of the hub to get it to go lower. 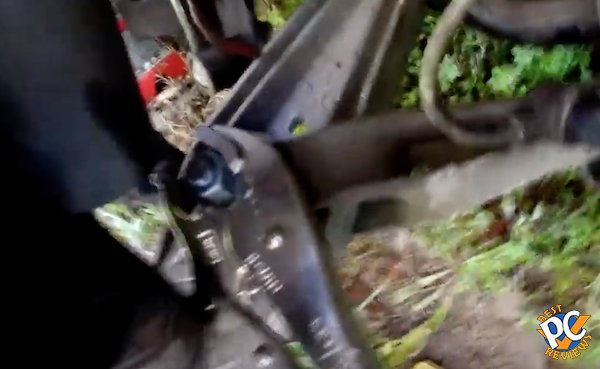 Put the sway bar link back. 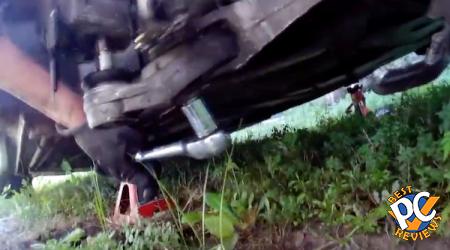 It was very easy for me and I rotated the wheel hub to my advantage. Once the bar link is back in the hub, secure it lightly. I always wait before I secure everything tightly. Now secure lower control arm nut and the fork. Now that all suspension components are secured, except tie rod end, you can secure everything tightly. 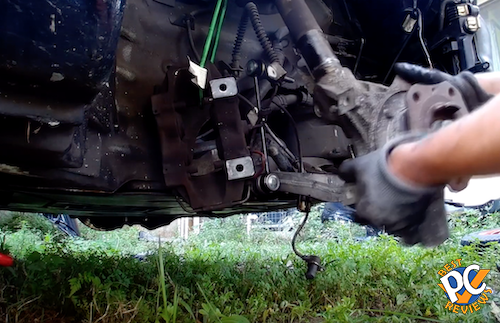 I wait for tie rod end just because I can rotate wheel hub around while securing everything else. Secure the abs connector and sensor. You can secure those tightly. 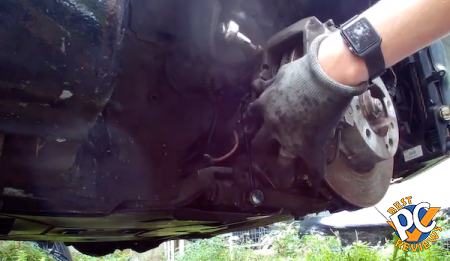 Now secure the tie rod end link. Use T40 star and 18mm. Once all is secured, put rotor back on. If you have screws, put screws on, but you don’t need to secure them very tight. When you attach rotor, move it around to make sure the rotor is not touching the dust shield behind. IF it does, use a screwdriver to move dust shield away from the rotor. 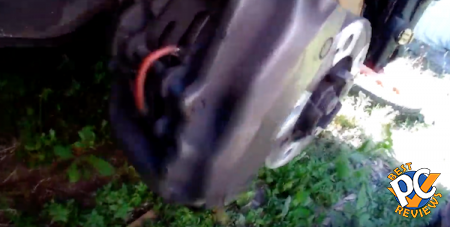 Attach the brake caliper to the rotor. 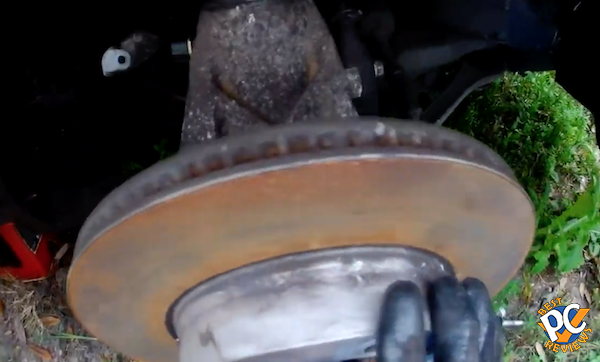 Before you put bolts back in, make sure the caliper sits flat on wheel hub. This step took me awhile because the bolts (T55) did not want to go all the way in. I think it was because my wheel hub replacement was dirty and rusty. 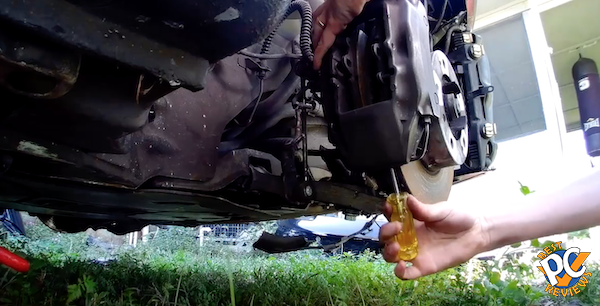 What helped me was WD40 in the bolt holes and anti-seize lubricant on the bolts. Put the bracket for brake line back into the wheel hub. 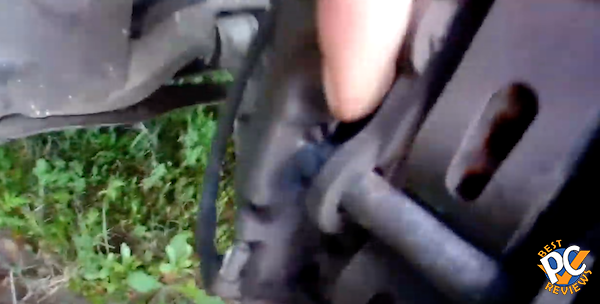 When I did this, I broke this bolt as well. Seems like possibly a common issue, but if you’ll do it, use WD40 and try not to break it. 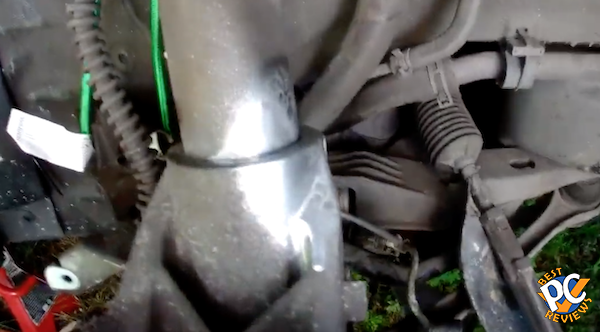 If you break it, it won’t be a big deal and the vehicle should run with no issues. Next step is brake pads. If yours are bad you can replace them. I kept mine. 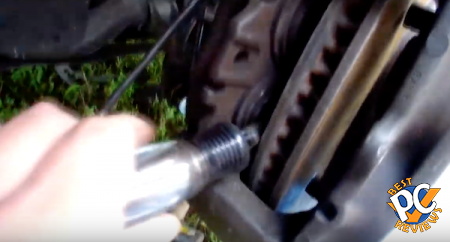 You might need to use a flat head screwdriver to move the pinions away from the rotor so that you’ll have room for the brake pads. Now we’ll put the metal retention pin with that small pin with the brake pads bracket back in. Make sure you align the holes on the metal rod so that the small pin goes in easily. I used hammer to get the rod back there. At this time, you can start your vehicle and move the wheel to get better access. 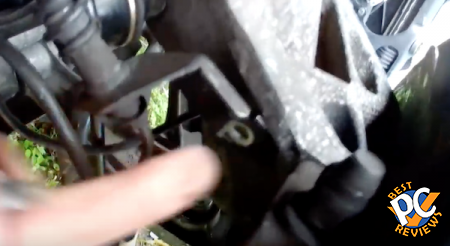 When the rod goes inside the caliper, push the small pin into the rod. Final step is connecting the sensors. You are all set. 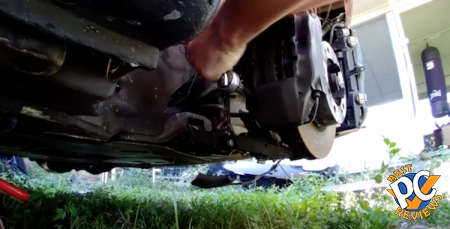 If you will not do any other work on this side of the vehicle, you can also put the wheel back on. If you did this project yourself, you saved yourself a whole lot of money. If you have any questions feel free to post here. Obviously, I am not liable if you damage something or hurt yourself. Use this guide for informational purposes. Here is the full DIY video. I think the video will also provide you with lots of details so be sure to watch it on top of reading the guide.